I’ve been listening to the rough mix of the rhythm section… and I’m just SO pleased. The groove they found is so true to my hopes, dreams and “vision” for the piece. It’s easy to listen to, and just darn toe-tappingly joyful! Thanks guys! And… I just found out next Monday we’ll record the amazing clarinet and violin players from the Maxwell Street Klezmer Band. Oh joy! Yup! Today we recorded the rhythm section: drums, bass and keyboard. What amazing musicians!!! This process of recording is just fascinating. While I’d thought I’d heard the music in my head, the music took turns and twists I didn’t expect – and that I DO love. And watching the process of musical negotiation between the three of them, with me and Steve Rachid… well, just fascinating!!! Steve will be getting me mp3s of the recording tonight… both with my uke and vocals and without, so I can hear what we’ve done and practice with the rhythm section. Next: the amazing violin and clarinet of the Maxwell Street Klezmer Band will lay down their sweetness and joy throughout, laying this musical painting with rich, vibrant colors!!! 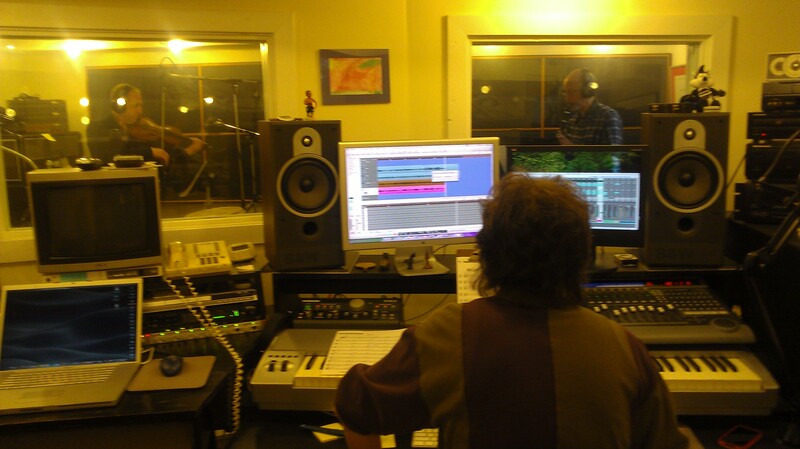 I went into the studio last Tuesday to start recording a song from A Shabbat Sweet. Steve Rachid is producing the song. Turns out he’s not only a really nice guy who is incredibly easy to work with, he’s also an Emmy Award-winning producer! Yeah, I’ll take that combination! We started recording recording “Shir Hashirim (The Song of Songs).” Just a simple recording of my voice and uke as the song structure for the rest of the musicians which will next be drums, bass and keyboard. It was really a great start. I am so incredibly lucky to be able to do this.